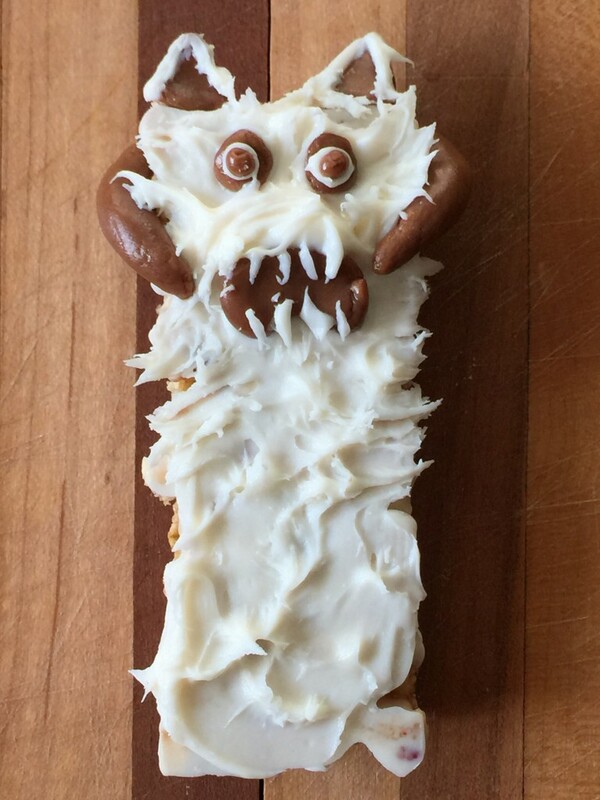 Wampa Granola Bars, a Perfect Star Wars Snack! Looking for Star Wars Party treats? 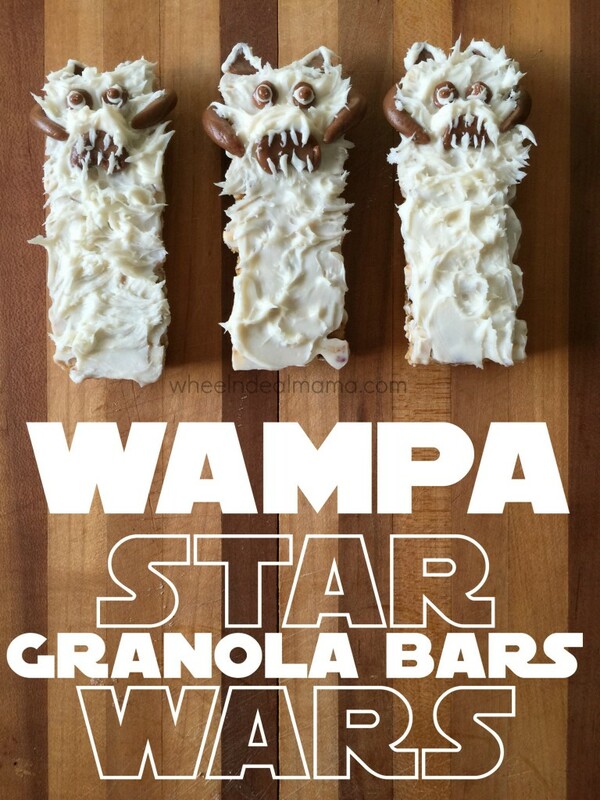 These Wampa Granola Bars are the perfect Star Wars Snack! Sweeten up a classic granola bar and turn it into something fun. With the new Star Wars movie coming out in just a month, you and I both know that kids will want some Star Wars themed treats. These are EASY to make too! Be sure to follow me on Pinterest for more great recipes. Pinch off two equal sections and roll until you have formed the Wampa’s tusks. Pinch off another section and shape it into a flat crescent to form the mouth. Do this again with two more equal sections until you have formed two flat triangular ears, disk eyes and rounded pupils. Use a knife to spread white frosting liberally over the top of the bar. Place a small mound of frosting near the top of the granola bar to form the snout. Place the Wampa’s tootsie roll eyes just above the snout. Use your toothpick to place a small dab of white frosting on the eyes and then place the tootsie roll pupils on top of the white frosting. 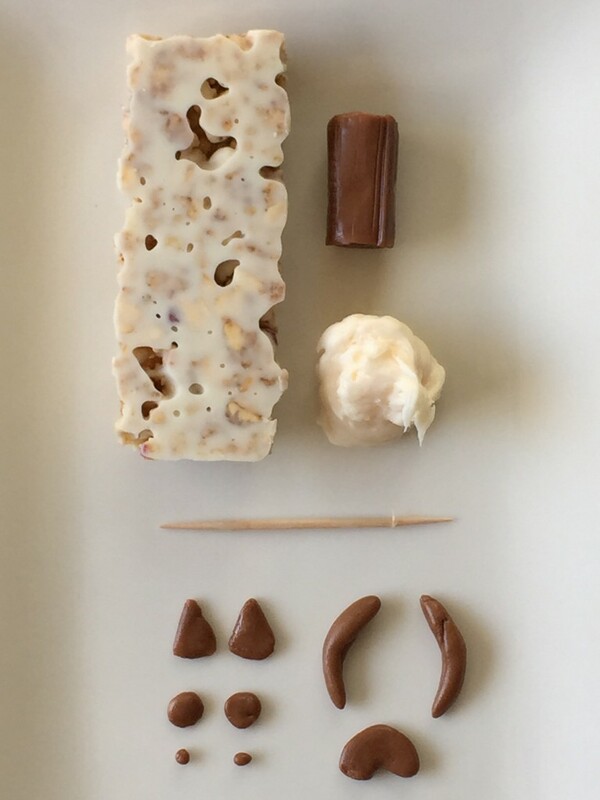 Press the triangular ears onto the top of the granola bar. If the candy isn’t tacky enough you can use some frosting as glue. Affix the tusks on each side of the face so that they point inward towards the snout. Next place the Wampa’s mouth under the eyes and snout. You are then going to use the toothpick to lift up and outward all over the Wampa’a frosting body. This will form peaks that will look like fur. Be sure to do this on the tips of the ears as well. Now we are going to make the razor sharp teeth. This can be accomplished by pulling up on the frosting until you have a small peak on your toothpick and then placing that peak onto the mouth to form teeth. Repeat this process for as many Wampa bars as needed.